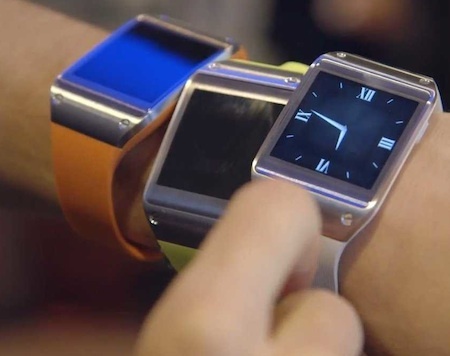 I've been looking at the recent ideas for the consumer technology called "wearables" - wrist-borne computing devices. I'm not that inspired. Mostly, they look like big wrist watches, and are secondary display devices for your smartphone (which you must also carry somewhere). 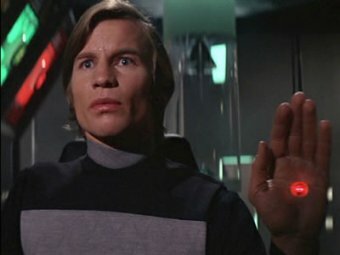 So, I was wondering if sf authors have any useful ideas for devices that are either wearable or skin-implantable, and provide some sort of visible display outside the body. A similar idea is the cardioplate from Harlan Ellison's 1965 story 'Repent Harlequin' Said the Ticktockman. This idea was used in the 2011 film In Time; their usage is shown in the picture below. Another example of a device that shows others information about you is the ER - emotional register, a small disk worn in the center of the forehead that shows the emotional state of the person wearing it. The ER is from the 1961 story The Primal Urge by Brian Aldiss. Perhaps readers have other ideas?